District 12 is gone, reduced to a smoldering heap of rubble. District 13, long thought annihilated, survives below the wreckage of its old structures. And Panem is once again in the grips of revolution, sparked by the defiance of a loosed arrow and spreading swiftly across the remaining districts. This is the new world order Katniss Everdeen (Jennifer Lawrence) awoke to in the closing minutes of last year’s dystopian blockbuster Catching Fire. Taking place days, perhaps only hours, after the events of that superior sequel, The Hunger Games: Mockingjay—Part 1 finds the heroic archer stepping out of the frying pan of a televised death-match and into the fire of its aftermath. The Hunger Games are over, but her troubles have just begun. Katniss, as it turns out, isn’t the only one facing new obstacles: The makers of this surefire smash have erected their own daunting hurdle, and that’s the difficulty in finding a way to cleave one self-contained tome—the final book in Suzanne Collins’ bestselling trilogy—into two satisfying installments. This is the future of big-budget filmmaking, a Hollywood hustle to turn profitable source material into multi-movie investments. 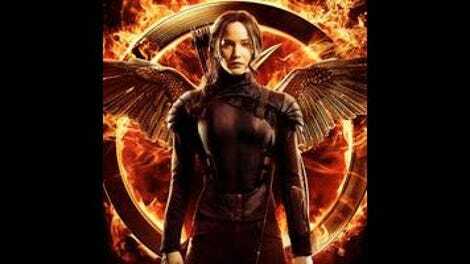 It’s good for business but bad for drama, and the inelegantly titled Mockingjay—Part 1 suffers from an unavoidable sense of anticlimax. It doesn’t build to an ending so much as just eventually grind to a halt, like a video game demanding more quarters to continue playing. To be fair, the last movie didn’t offer much in the way of resolution either; it went out on a blatant cliffhanger, hooking audiences with a final rush of big reveals. But at least there was some oomph to that outro, a sense of actual punctuation. The worst thing one could really say about Catching Fire is that it was working from a structure too similar to that of the original, as though Collins had simply struck the reset button on her own work. 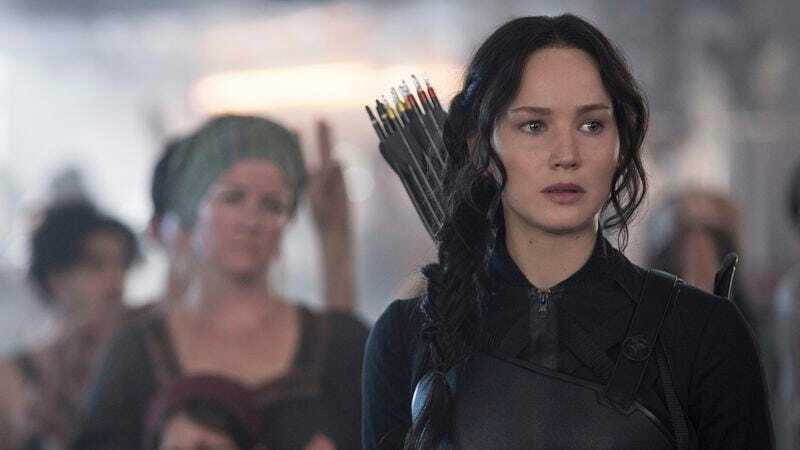 Mockingjay, by contrast, actually deviates from the established pattern, and one is relieved to discover how much better The Hunger Games is without the Hunger Games. The stealth highlight of this franchise has always been the flavorful cultural satire, which takes center stage throughout much of Mockingjay’s fleet runtime. There’s a slyly meta, hall-of-mirrors quality to some of this material: Lawrence, an actress who became famous because of this series, is playing a young celebrity whose body everyone wants to control and exploit. (At one point, on-the-wagon mentor Haymitch, played again by a terrific Woody Harrelson, argues that plastering her in makeup obliterates her authenticity and youth.) And when the rebel PR team creates a call-to-action ad featuring Katniss, the logo is identical to the one that’s been used to sell the Hunger Games movies. Like the franchise-flick equivalent of No, the film argues that revolution can be peddled in the same manner as a Hollywood blockbuster. Likewise, the best moments of Mockingjay dare to suggest that Katniss is just a pawn for the other side now, her image manipulated anew. That point would sting more, though, if the Collins’ future-shock world allowed for more ethical gray area. But just as the Hunger Games of the last two movies tended to divide combatants down clean lines of good and evil, the battle here between the empire and the rebels is ultimately as cut-and-dry as the one in Star Wars—especially given the lip-smacking villainy of Donald Sutherland’s bad president, whose tyranny is so great that any means to end his reign would be justified. Furthermore, the film seems to complicate its least interesting relationship, only to then back-peddle. How much more exciting would it be if Collins entertained a real motive for the dismaying behavior of love interest Peeta (Josh Hutcherson), rather than chasing away the moral ambiguity with an easy explanation? Mockingjay is solid, proficient entertainment, but it lacks a spark of real emotional conflict—the little something that might have made it feel worthwhile to pay full price for half a story.